(Newser) – Gov. 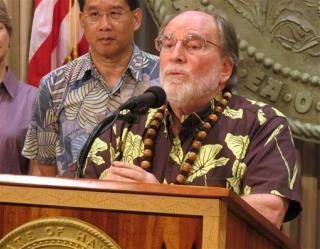 Neil Abercrombie yesterday called for a special legislative session to move forward on a bill that would legalize gay marriage. If lawmakers pass a bill, Hawaii would join 13 US states and the District of Columbia in allowing gay marriage. The special session is scheduled to begin Oct. 28. Abercrombie said he chose to call a special session rather than allow legislators to consider the issue next year in part because of implications on taxes for this year. "There are serious, deep, and wide-ranging consequences," he said. What "religious exception"? If you don't want to marry someone gay, then don't. Oh well, the ubiquitous "religious exemption." I'm all for intellectual freedom but why must supernaturalism, which is a wild and wooly, often conflicting collection of unprovable and unsupportable claims, always get an exemption. Reality always is pushed aside for this made-up nonsense. I wish that one day OBJECTIVE REALITY be given an exemption from supernaturalistic LUNACY.